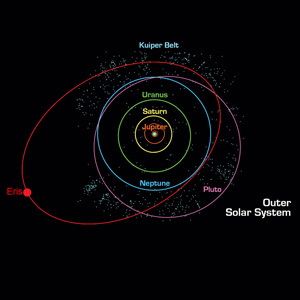 The location of the Kuiper Belt at the edge of our solar system. The Kuiper belt otherwise known as the Edgeworth–Kuiper belt is a region of our solar system that extends beyond the orbit of Neptune and is 30 to 50 AU (astronomical units) from the Sun. A single AU is the equivalent to the distance from our Earth to the Sun so the approximate distance to the Kuiper belt is 4.5 billion km to 7.4 billion km from the Sun. Due to the distance away from us there is still a lot to be discovered about the Kuiper belt but we believe there to be hundreds of thousands of icy bodies that are larger than 100 km in diameter and more than a trillion comets. Pluto, Eris and Ceres which are 3 of the 4 newly categorised dwarf planets are found in the Kuiper belt. The Kuiper belt was named after the astronomer that predicted the existence of the system, Gerard Kuiper. 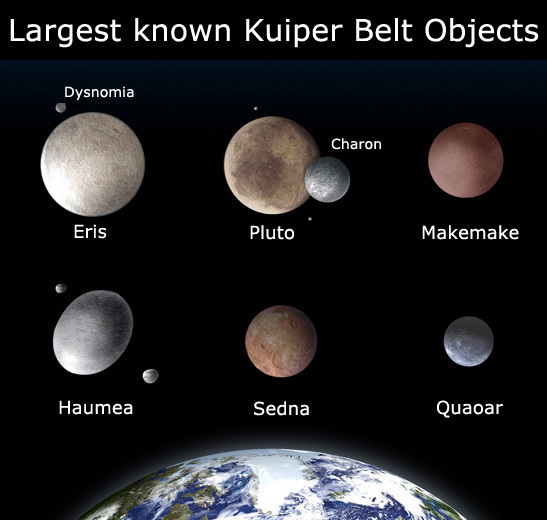 Read on for more information about the Kuiper belt. 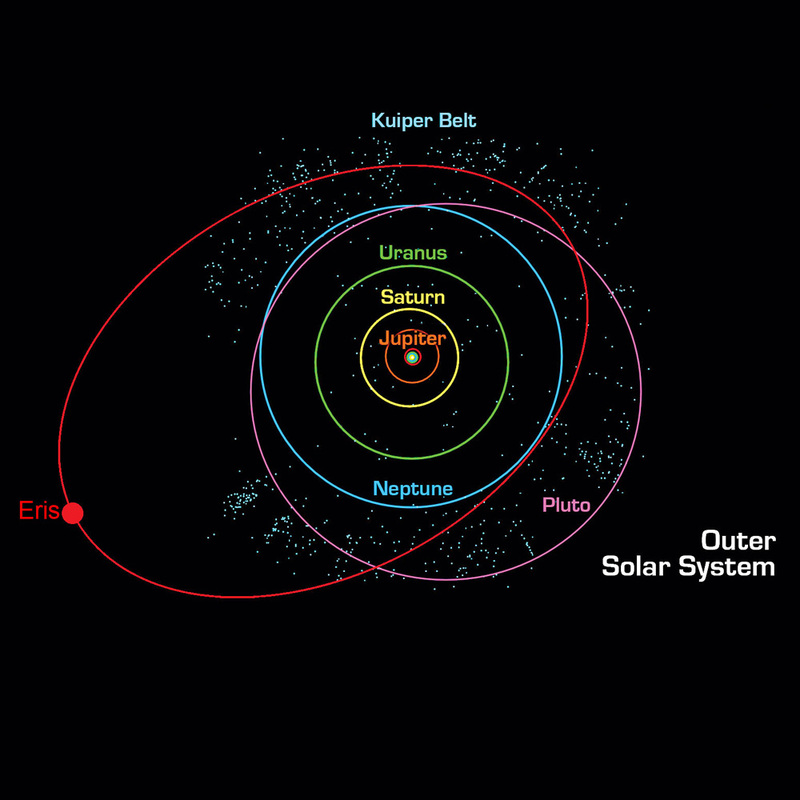 The Kuiper belt is a region of space that is shaped more like an ellipse than a circle and it is the most recently discovered part of our solar system. We have only discovered a fraction of the objects in the Kuiper belt due to the distance the system is from the Earth. It is estimated that there are well in excess of a trillion objects in the Kuiper belt. We have currently documented the existence of over 1,000 Kuiper belt objects (KBO). This figure is regularly increasing as viewing and measurement techniques are improving. Pluto (one thought to be the ninth planet in our solar system but since relegated to dwarf planet status) is the most famous object that is found in the Kuiper belt. No spacecraft has studied the Kuiper belt up close but the NASA New Horizons will venture into the Kuiper belt in approximately 2015 once it has conducted a study of Pluto. The contents of the Kuiper belt are thought to be the materials left over when the solar system was created 4.6 billion years ago. The Kuiper belt is 20 times wider than the main asteroid belt. Two of the moons in our solar system Neptune’s Triton and Saturn’s Phoebe are thought to have come originally from the Kuiper belt. Objects that can be found in the Kuiper belt (KBOs) can also be referred to as trans-Neptunian objects (TNOs).